1. 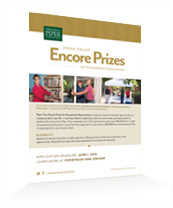 What do Piper Trust Encore Prizes for Exceptional Organizations recognize? Piper Trust Encore Prizes for Exceptional Organizations recognize nonprofits and public agencies that are addressing critical human resource needs by engaging the growing numbers of people, age 50+, in leadership roles and encore career opportunities that enrich lives and advance the common good. 2. 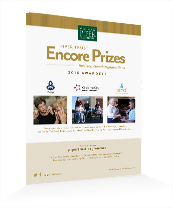 How often are the Piper Trust Encore Prizes for Exceptional Organizations awarded? Piper Trust launched this prize opportunity in 2012; the prizes will be awarded every two years. The next opportunity to apply will be in Spring 2018. 3. What do the awardees receive? Up to three organizations (nonprofits or public agencies) will receive a prize of $5,000. In addition, one of the awardees may receive a $50,000 Piper Trust Encore Enhancement Prize to further its work of engaging the talents of older adults, age 50+, in the organization’s mission and social purpose work. 4. Are the prize awards considered grants? Yes, the $5,000 prizes and the $50,000 Encore Enhancement Prize are grants with terms and conditions. 5. What types of organizations are eligible? Nonprofits and public agencies in Maricopa County are eligible to apply or be nominated by others. Nonprofits are required to have operated as a 501(c)(3) for a minimum of three years. 6. Can a current Piper Trust grantee still apply or be nominated for the Piper Trust Encore Prizes for Exceptional Organizations? 7. What are examples of organizations that engage people, age 50+, in encore roles, positions, careers? In 2012, 2014, and 2016 Maricopa County nonprofits were awarded Piper Trust Encore Prizes for Exceptional Organizations – view more information about these organizations here. A nonprofit engages encore workers as direct caregivers for its programs serving people with disabilities of all ages. The project specifically recruited and trained 50 older adults (age 50+) for placement in caregiver roles with clients. To fill the leadership transition challenges experienced by many nonprofits, a nonprofit recruits, trains, and places retired executives in interim director positions. A public safety agency recruits and employs encore workers to fill jobs at all levels. One-fourth of the department's civilian and sworn workforce is age 50+, coming from previous careers in government, retail, and business. To provide homes to people living in substandard and overcrowded conditions, a nonprofit has purposefully built a multigenerational workforce. An environmental nonprofit uses a highly effective recruitment strategy that seeks the skills of experienced encore workers and further, ensures that retention is monitored and flexible schedules are offered. A technical training school employs retirees from the building trades as instructors to provide training and individualized support to an "at-risk" student population. 8. What does compensation for encore workers mean? The strongest applicants are those with encore workers who receive some form of compensation, broadly defined, in return for leadership and/or professional/technical expertise. Compensation can include things such as stipends, salary, health insurance, living allowance, expense reimbursement (e.g., mileage, meals); office space, administrative support, use of computers/Wi-Fi/cell phones; or other creative benefits. 9. Will the Piper Trust Encore Prizes for Exceptional Organizations recognize practices that increase volunteer opportunities? Awardees are organizations that do more than recruit volunteers for part-time assignments, valuable as that is. Organizations engaging individuals, age 50+, solely as traditional volunteers are not eligible for the prizes. 10. Who can submit an application or nomination? Applications or nominations are welcome from any individual who is familiar with the work/practices of an organization, including an employee submitting an application on behalf of his or her organization. 11. Can a nominator submit applications for more than one organization? There is no limit to the number of applications a nominator may submit; however, multiple applications for the same organization are unnecessary and discouraged. 12.What is the application deadline? The application process will open in Spring 2018. 13. How do I submit an application/nomination? 14. Should I send letter(s) of support and/or additional materials along with my application? No. Applications will be evaluated based solely on the answers submitted on the application form. Additional materials will not be considered. During the review process, some applicants may be contacted and asked to provide additional information and/or interviewed. 15. How will I know that my application has been received? An acknowledgement page will appear confirming that your application has been submitted. 16. How will applicant organizations be evaluated? Intent: Are intentional practices in place to engage older adults, age 50+, in the organization’s social purpose work? Social Purpose: What is the social need addressed by the work/encore workers? Social purpose work refers to work that directly contributes to solving important social problems, meeting important social needs, and improving life for people and communities. Impact: How many individuals, age 50+, are engaged in encore roles at the organization and how are they being compensated? Note: Compensation is broadly defined and can include things such as stipends, salary, health insurance, living allowance, expense reimbursement (e.g., mileage, meals); office space, administrative support, use of computers/Wi-Fi/cell phones; or other creative benefits. How does the organization measure the impact of encore workers’ contributions? Creativity: Does the organization use resourceful solutions to overcome obstacles in recruitment or retention of encore workers or to expand opportunities for encore workers? Replicability/Expansion: Does the organization have an encore engagement model that is inspirational? Does it have a “best or promising practice” in place that could be replicated by other organizations? Can the model or practice be extended to engage more people? 17. Who makes the final award selection(s) for Piper Trust Encore Prizes for Exceptional Organizations? A selection committee, comprised of local and national members, will present a recommended slate of awardee(s) to the Trustees of Virginia G. Piper Charitable Trust for final selection. 18. How and when will prize awardee(s) be notified/announced? Awardees will be contacted by a staff member of Virginia G. Piper Charitable Trust; awardees will be announced/celebrated at a Piper Trust event in the fall of 2016. 19. Whom should I contact for additional questions or assistance? 20. Will Piper Trust Encore Prizes for Exceptional Organizations be offered again? Yes, Piper Trust’s Encore Prizes for Exceptional Organizations are planned to be awarded in even-number years; the next offering is planned for 2018. In odd-number years, Piper Trust recognizes an outstanding individual for his/her encore career with the Piper Trust Encore Prize for Career Excellence.